Kaos Cod Flys Vs Murray Cod. The spill on the fishing hot spots, tips and techniques! The Loddon River has an endless amount of water to fish and explore. Walking the banks casting to find those deep holes or kayaking to get in those tighter spots that are not excusable from the bank, you are sure to find a hot spot. Boating can be restricting to the amount of water you can fish, it all depends on what size vessel you may have and what hard yards you’re willing to do. Murray cod lurking the water edge looking for a free feed is common. Vibrations, movement and noise on the water is what the cod is after, not a huge racket but enough to get the cods attention to make him interest. 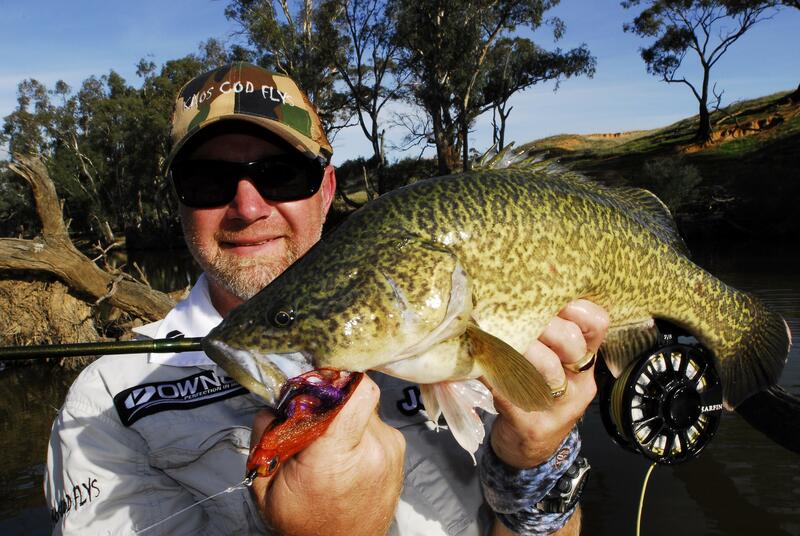 kaos murray cod fly fishing. Manipulating our flies’ surface or sinking in to a bait-fish pattern, reptiles, frog, moth, mouse or any sort of insect or in fact a small bird that may have landed on the water surface… Natural presented and well placed flies to provoke a magic surface strike. Surface fishing big flies can be a little intimidating but very rewarding at the same time. Stripping the fly slowly as it dart off left and right, you’ll get the effect with a clinch knot and can have a similar effect with a loop knot. Only move the fly short distances then pause and repeated with more twitches. By striping the line back this way it gives the motion of a injured a animal. Striping the line back with quick strips in a straight line may resemble a frog or any other mammal on the water trying to get back to a safe place, with this retrieve you’ll need to tie a loop knot. These techniques’ work fantastic with a floating line but can have a similar affect using an intermediate line. 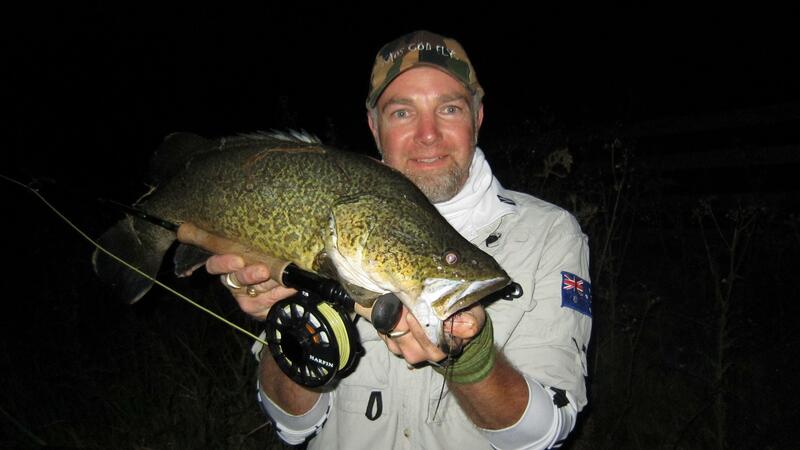 As winter closes in the larger Murray cod will be on the move. As the action on the water might not be KAOS, the rewards will be more fulfilling with a huge cod inhaling down your fly! 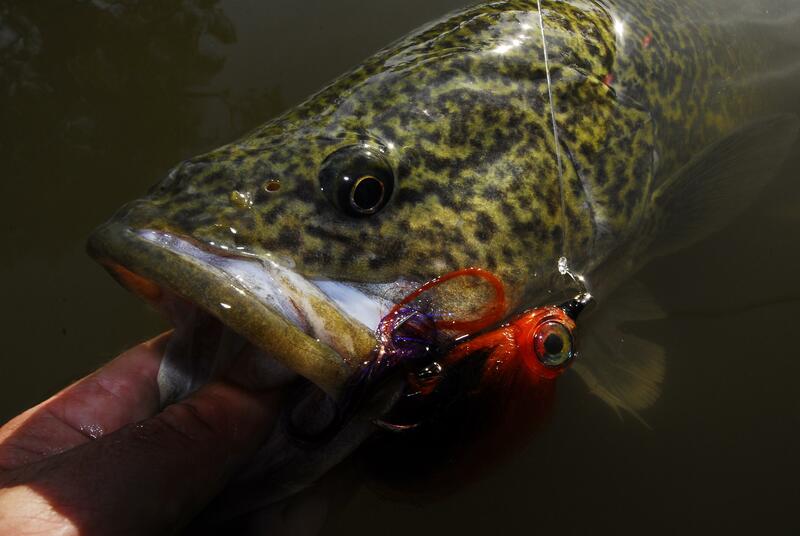 Kaos Scud – 5/0 articulated murray cod fly! There are many parts to sport of fly fishing from the aquatic entomology to the presentation. The fly fisherman and women must know and understand the cycle of nature, the food sources we try to imitate and their life cycle. 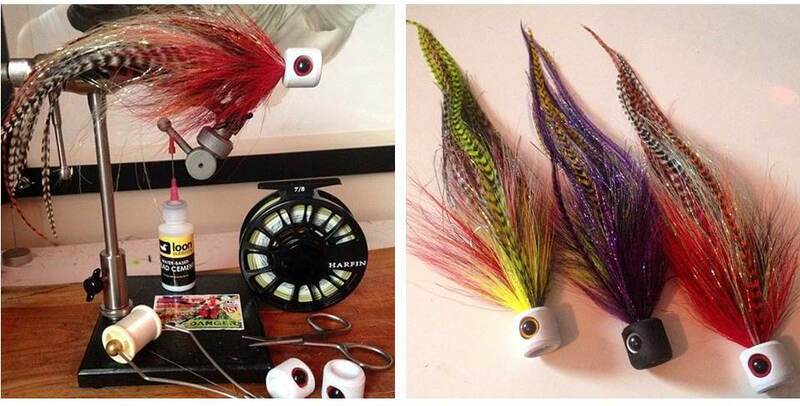 Of course tying flies is an art form all on its own. The creator brings fur and feather together in a very individualized interpretation of nature. This interpretation is to be inspected up close and approved with a strike or rejected at the very last nanosecond, this will skip a heartbeat so be careful. The artist is attempting to represent life itself be it, insect, baitfish and amphibian through colour and shape. Be careful fly tying can be very addictive especially when using your own creation.